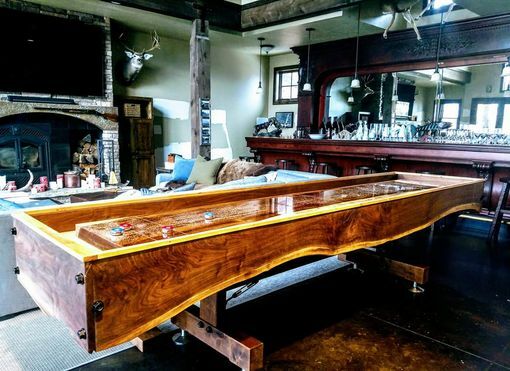 This set was made for a client's game room. 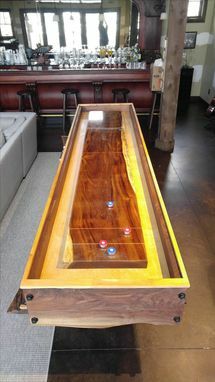 Completely Customized Shuffleboard Tables available. 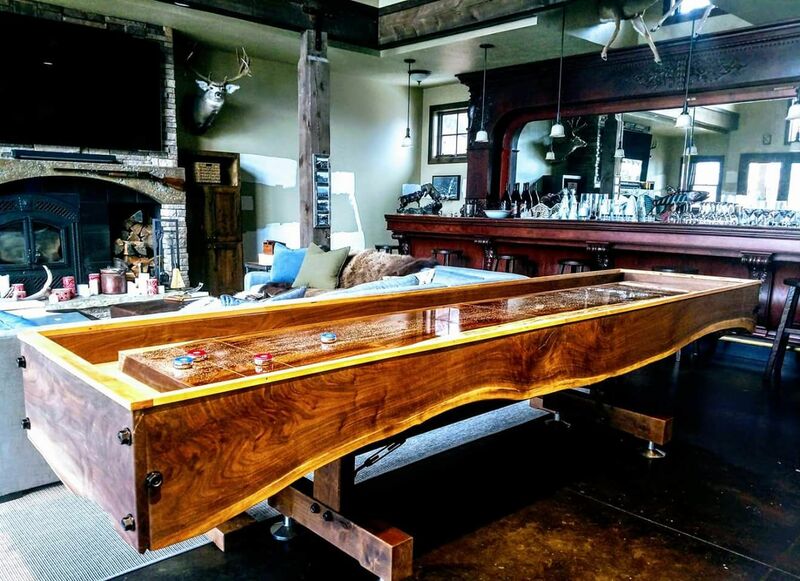 This one is a 12' long with a 10/4 Black Walnut Live Edge Box, 10/4 Monkeypod Playing Surface with in-laid Maple foul score lines to match the same on bench and top edge of box. 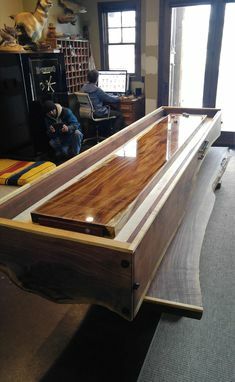 Also had a 10'6" long 12/4 Black Walnut Live Edge bench seat (which was made to stow under the game when not in use), a Removable Maple Cover (allows the game table to be used as a serving area during there special occasions), and custom puck caps (one set in Walnut / one in Maple) with the logo of their lodge engraved. Each and Every Game system I make includes the following items which will allow you to enjoy your game shortly after initial set up. 3 year warranty against defects & workmanship. Complete Set of Playing Pucks sized for your game. Instructions on Use & Care of your gaming system. There are other options available and each and every order may be customized to suit your needs. We also offer special delivery of these pieces and customized delivery & set-up if you so choose. As you can see from this set, the options available to you are only limited by your imagination. I assure you, ordering one of these systems from us will be well worth your money and my time. Average turnaround time is 6-8 weeks. Exact time will depend on size & specifics of your order. Let's create one together today!